When many people think about the most significant, high-traffic areas in their home, the kitchen will often be excluded. But when you think about it, the kitchen is one of the most important areas of our domain! It plays a central role in the home for the whole family, especially if your family is keen to making home-cooked meals and hosting guests. So if you’re working on designing a new home or looking for a kitchen renovation, don’t take this power-room for granted. 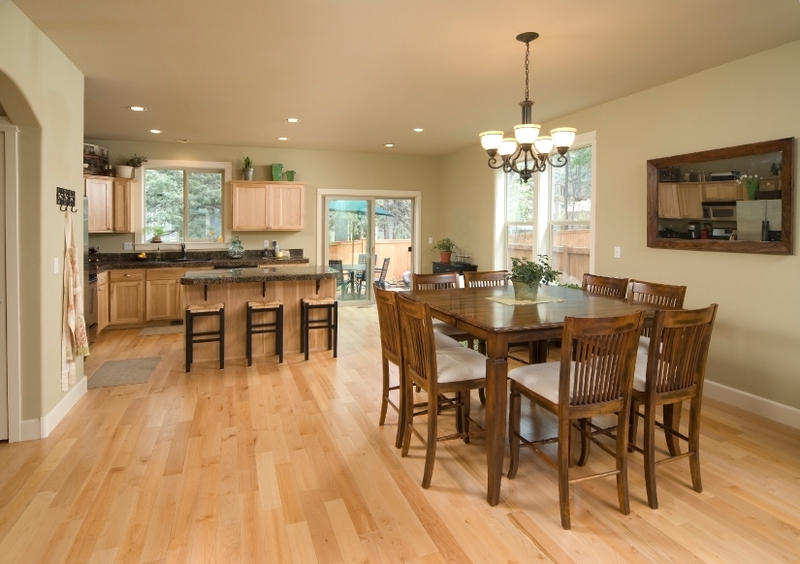 Take a look at some considerations for choosing the right kitchen flooring based on style, durability, and the nature of use. Before you begin to search for the perfect kitchen flooring, you’ll need to take in mind some basic considerations. For many, one of the top considerations will be cost. It’s important to stay within your budget, but to also make sure you’re getting flooring that delivers a high ROI and will last to create a strong bang for your buck. You’ll also want to consider your lifestyle and the nature of use. Do you have a big family, with kids running and dogs jumping and silverware dropping when the whole family is over for dinner every week? If you have a high-traffic kitchen with a lot of use, you’ll also want to consider durability and ease of cleaning/maintenance. We could go on and on about each type of flooring – the pros and cons, their durability, the variety in which they’re offered. Frankly, this would take much more than a blog post! So here’s a very abridged version of some of the most popular types of flooring that offer a great balance of style and cost. Ceramic tile is one of the best, safest best for suiting most types of style and budget. Ceramic is available in a virtually endless combination of colors, sizes, shapes, and patterns, and it’s durable to boot (pun intended). Hardwood takes the cake in style – it can make any room look clean, warm, inviting, and sophisticated. If it’s properly cared for and treated, it can also last your family a long time to come. For example, you’ll need to clean spills right away, and regularly refinish to polish away scratches and dents. Some view vinyl as a bit of a taboo, as it wasn’t quite well known as being the most sophisticated type of flooring. But that’s changed! Vinyl is one of the least expensive flooring types on the market, and can be made to resemble wood, stone, ceramic, and more. If you’re looking for help with the kitchen you’ve always dreamed of, call us at (407) 262-7979 to get started today!